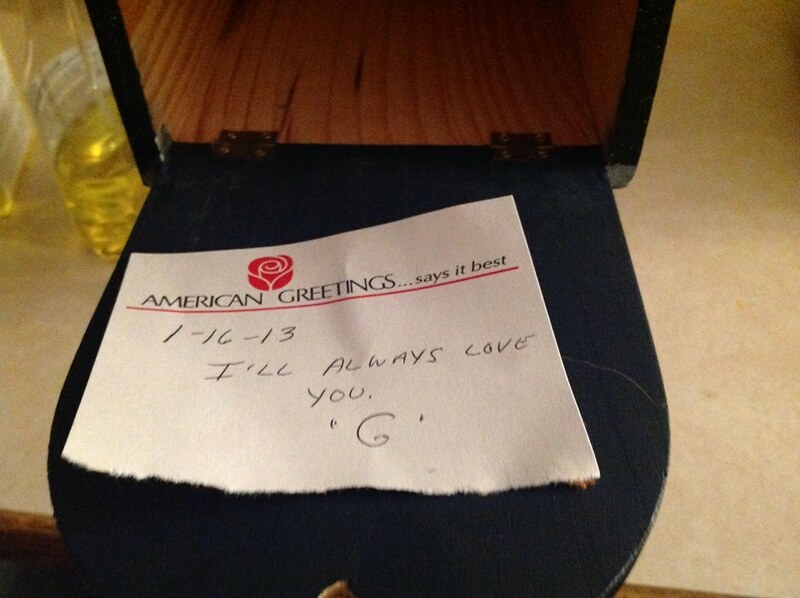 She opens up the first box, reaches in…and sees a little note with my Mom’s handwriting on it. “Take care of each other, Love Mom” was written on it. We were just in awe. It was of course a bit of a shock to see my Mom’s writing on something in a decoration box of all places. But we assume she must have thought “Well, they’ll have to go through this box at some point” to ensure that we found it. It was such a last-minute decision to even decorate the house, knowing we couldn’t do it justice like Mom did, that I almost thought it was luck that we even found it. Fast forward to just after Thanksgiving. My sister and I decide we are going to try to bake my Mom’s dessert bread. This bread is very special. It’s a recipe my Mom found years ago when we were little and she made it for her friends for Christmas and she made it for Easter too. This was HER bread. And it tasted amazing! While we waited for the bread to rise, I asked my sister if she and the boys would help me put ornaments on the Christmas tree. It’s been kind of hard to get in the festive spirit but we put on some Christmas music and started opening up the ornament boxes. Guess what we found in the first box? Yes, another note from Mom!! She actually wrote it in 2011, just a quick little line about “I’ll always be near you.” Then she wrote underneath that note in 2012. “I miss all of you.” At first I thought she just got the years wrong but Nicole and I think she just wanted to write notes even when she wasn’t sick, just in case. We hung up the ornaments and I went through some other boxes of decorations to see if I could start to put things up around the house. I immediately started looking for this mailbox she had. It has a snowman on it and it’s pretty big but small enough that she kept it on our island in the kitchen. She would put little toys or pieces of candy in there for the boys. So everytime they came over, she’d say “Check the mailbox!” She always had two of everything she bought – one for Matthew one for Sean. So they walked over and opened it up expecting to find candy or something from me…Sean can’t read of course but Matthew saw it and started to smile. I told them “Go show your Mom.” So they went over to Nicole who didn’t even know I had found the mailbox and they showed it to her. And of course my sister just kind of cried and I started to tear up but I didn’t want Sean to think I was sad and it was interesting because his reaction was sort of joyful. Almost as if he thinks “Well duh of course she misses me.” My mom’s big concern was that Sean would not remember her and I assured her he would. He probably mentions her more than any of us at really random times. I think my Mom speaks to him through him. I wouldn’t doubt it. He dreams about her a lot too. 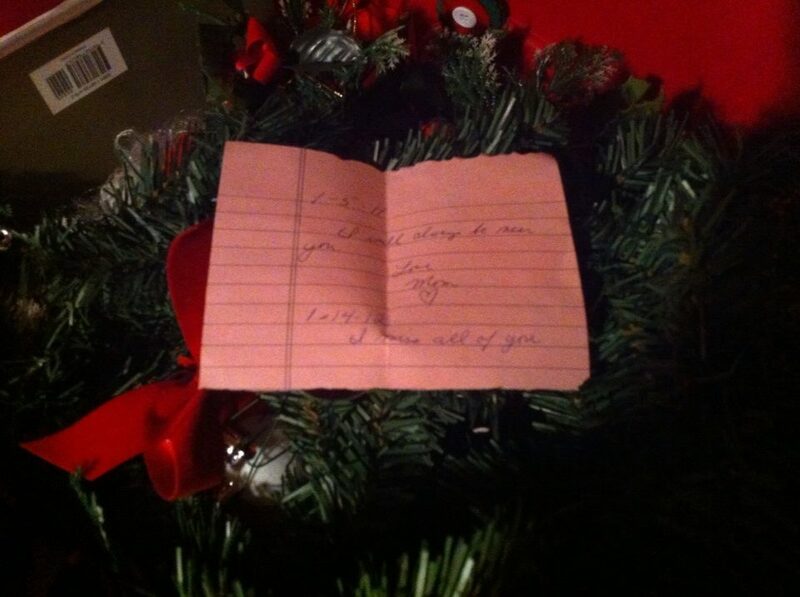 Since that night I have found one more note in a wreath box that was dated in 2011 as well. It was so nice having this little treasure hunt of sorts around this time of year. It’s obviously the first Christmas without her so it’s been a little difficult. But knowing she left these notes for us to find after she was gone has helped ease the pain. This Christmas, as my family and I sit down to dinner, we’ll attempt to make it as festive as we can. It won’t be the same but now we can tuck these notes away and take a look at them when we miss her the most, and see that she’s still here. Watching, making sure we’re taking care of each other, knowing that she will always love us.